gold medal catch signed Japan. Beads start at 14mm and necklace is 24". This is a fantastic necklace. All white glass beads with crystal accent beads. Silver catch marked Japan, the necklace is 18". bead size starts at 12 mm. bead size starts at 10 mm. Gold metal catch signed Japan. at 12mm, neat gold catch. the necklace is 21". Neat matching catch signed Japan. Austrian black crystal necklace. Old plastic clasp signed Made In Austria. The necklace is 20", bead size starts at 8mm. size is 10mm and the necklace is 24". Rhinestone catch. Ivory and black glass crystal bead 24" necklace. This necklace has a glass clasp, not signed but looks Czechoslovakian. Nice black glass crystal bead 29" necklace. The beads are 10mm and in excellent condition. 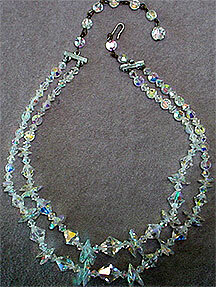 Unusual aurora borealis crystal glass bead 16" necklace. Excellent condition. 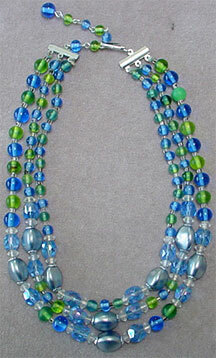 Nice 16" three strand necklace.